Description: Caespitose, greyish pubescent perennial to 0.8 m high. Leaves with sheath velvety; ligule to 3 mm long; blade 2.5–5 mm wide, densely pubescent. 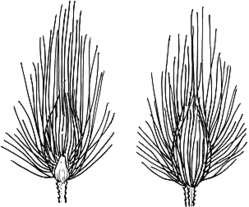 Common axis 2.5–12 cm long; racemes spreading at maturity, naked for lower 2–12 cm, lower 8–25 cm long. Spikelet pairs remote, the shorter pedicel mostly 1–1.5 mm long, the longer mostly 2–5 mm long, or sometimes the lower spikelets solitary on pedicels to 8 mm long. Spikelets usually 2.5 mm long, covered with silky hairs that are at first appressed and exceeding the spikelets, then loosely spreading. Lower glume mostly 0.5–1.2 mm long, glabrous, nerveless; upper glume and sterile lemma equal, 2–3 mm long, densely villous with long soft hairs. Fertile floret a little shorter than the glume and lower lemma, c. 2 mm long, distinctly pointed or apiculate. Distribution and occurrence: Scattered in a range of habitats, usually grassland or low open vegetation.